The report is made up on initiative of Member of Committee on Banks and Banking of Russian Union of Industrialists and Entrepreneurs, Chairman of Board of Millennium Bank, Mikhail Baydakov, under scientific leadership of Director of Schiffers Institute for Advanced Research, Prof. U. V. Gromyko and Member of Council of Italian journal “La Finanza” Paolo Raimondi. 2. Mechanisms of Russian fundamental science entry to the world technology markets. 3. Overcoming «death valley» when moving from the fundamental scientific discovery to technology. Subject of long-term investments. 4. New financial instruments for «death valley»: institutes of long-term investments. 5. Life strategy as a basis of strategic scenarios of development. An idea is being formed in the society, that the main type of social wealth, which will dominate after the current world crisis and in long-term outlook, is based on combination of knowledge, competence and material organization of manufacturing processes. That is why technological strength of modernization is the most important target of modernization. As a result of all transformations and changes, the country should be able to produce new technologies, which will allow marketing new products, or will be products themselves asked for at the world technological markets. However, one cannot guarantee that this goal will be achieved «by natural course of things». Because today Russia is still losing entire technological complexes and groups of technologies. It is a very serious challenge to understand that Russia may lose its opportunity to produce aircrafts, helicopters and trains, and soon it will be military hardware, like now it is cars, electronics, and cell phones. Space for science intensive products obtainable for the country is getting narrow quickly. In this situation there is a great temptation to count solely on buyup of turnkey technologies/processing lines. In some sectors policy of technological borrowing is possible and even necessary, if scientific and development groups are kept, which offer technological solutions leaving the world level behind, which will be discussed later. However, as a rule, one can buy turnkey only so-called screwdriver technologies, where know-how of technologies is hidden, and the outward form of technology allows low-qualified workers to use it. Staking on technological borrowing only, we are at risk of aggravating degradation of technology and losing remainder of fundamental practice-oriented science. In the latter case positive effect produced by technological borrowing will be quickly reduced. The reason for this is the following: to have an opportunity not only to buy, but also to master a new technology, one should be able to reproduce the whole infrastructure, which supports it. Full-fledged mastering of purchased technologies requires serious participation in activity related to technification of manufacturing process, as well as creation of environment friendly to engineering development. Otherwise, degradation of technology is inevitable in spite of purchasing advanced processing lines. One will buy technologies as if they are things, gadgets, but ability to develop them will be lost once and for all. In this situation even an attempt to create R&D centers on the basis of Russian research universities together with Western research and technological groups will not be saving. These R&D will make Russian research and applied groups dependent from the executive point of view, and will not allow Russian scientists together with top levels of power to independently set rational objects of promotion of technological frontiers (as it was done by Soviet government: human spaceflight, atomic project, air defence project, etc.). Besides, programming of new technologies and learning researches and project developments – different activities, which yield in different periods of time. Lack of rationally set and formulated objectives of development on the basis of creation of fundamentally new technologies and institute of professions will result in demonstratively fake products produced by research and technological, social and political groups. In other words, policy of technological borrowing will be strategically effective only as a part of complex national technological policy, which ensures overcoming of lag in a series of technological sectors and at the same time directs towards making pioneer technological solutions, which have no analogues in the world. Currently in the Russian Federation there is no technological policy, which is specially marked out and elaborated, integrating and using other types of policy as tools (scientific, tariff, customs, financial, educational, industrial policy, policy of regional development, etc.) This report is aimed at separation of the most important principles and a series of concrete substantial priorities, which could be assumed as a basis for the national technological policy. This scheme graphically shows the approach which we used while preparing this report. It has been written from the point of view of forming center of strategic scenarios of objectives of development of full-scale productive forces of Russia: fundamental practice-oriented science, developing education and innovative industry. Their quality will be determined by strategic scenarios seen as considered operations and liaisons of actions, and plans of development of full-scale productive forces, but not peculiarities of those various markets – resource, financial, technological, demographic – into which they are included. Within the frames of this approach main attention will be paid to the problem of overcoming existing break between Russian fundamental practice-oriented science and circulation of technologies in the world market. Russian technological industry, which is actually present at technology markets of Third World countries (atom for peace, high-technology weapons, for example, valley fire systems), though even there more and more driven out (failure of Mig-35 at Indian tender), really does not exist as an evident competitor in the sphere of generation of pioneer solutions for developed technological centers (Germany, Switzerland, USA, France, and even China nowadays), that is especially important in relation to those fields where Russian development teams and innovative companies are able to remain at the world «technological frontier», at the reached border of mastered and developing technologies. In the considerable number of directions Russian science still has leadership potential. There is a series of fundamental discoveries of new physical principles and effects converted into unique devices, on the basis of which technologies of next technical and industrial structure can be created. Below we will consider several examples of such developments, outlooks of their technological marketing and implementation within the frames of existing and new industries. 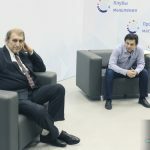 Course of modernization declared by the country’s authorities requires support of social stratum interested in supporting technological modernization. How can one form this social «motor»? Mainly, discussing this matter, one says that it is necessary to form special institutes, which activity will support definite quality of social and cultural environment. Reasoning like this, authors usually refer to popular foreign experience of activity of similar institutes in other countries, but not to their own experience. For sure, world experience in institutional solutions is important. At that, one should take into account that those institutes, which operate efficiently in other countries, at transferring to Russia should be reproduced on new bases and specially readjusted. One distinguishes, for example, controlled growth, transplantation, designing, institutional experiment, etc. However, the main problem of «institutional approach» with respect to our problem is that no environment itself cannot create the subject. Institutional solutions can turn into tools for modernization subject, if it exists already. In order to form modernization subject one needs that network groups involved into modernization processes in different spheres gain concrete experience in strategic target action. Only when it is gained and tried, it can be fixed institutionally. How can one gain this experience? One should develop strategic scenario of development of concrete sector and implement it. Particularly, the matter can be that fundamentally new sectors should be created on the basis of pioneer technologies (in the present report the matter will be about outlooks of development of laser-meta-industry as a «pilot project» of priority development). In order to make up modernization subject, organize processes of mastering of fundamentally new technologies and to further form an institute of new professions one needs appropriate tools, which determine competitiveness of modernization subject on a world scale. If these future forming tools only repeat and simulate results of activity of foreign modernization subjects, and Russian technological, scientific, educational, political groups could not generate their bold, but rational, plan of technological breakthrough, then modernization subject would not be formed in Russia and modernization would inevitably turn into Perestroika 2. 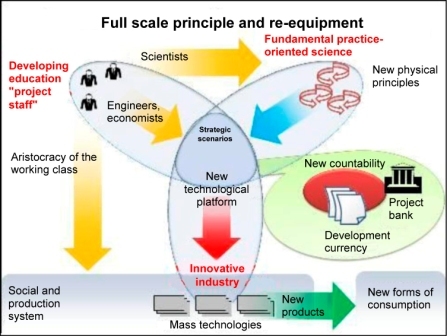 Using Figure 1, one can illustrate key requirement to formation of modernization subject at implementation of principle of development of full-scale productive forces. It is simultaneous synthesis, intellectual integration of positions of representatives of all three key fields of activity – practice oriented fundamental science, developing education and innovative industry – around common complex project of new technical and industrial, and social and cultural structure. This requirement is peculiar, because this kind of synthesis cannot be developed and implemented by means of all formats known for today: administrative methods of authorities, usual methods of discussion of topics in the course of scientific conferences and seminars, and so-called brainstorm of «the eggheaded». 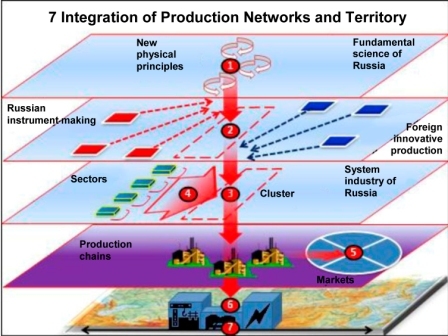 In Russia methodology of desired synthesis is developed, it is called strategic scenarios technique, which overcomes limitations of existing formats of intellectual integration and allows formation of modernization subject on the basis of principle of development of full-scale productive forces. In order to express and present this circumstance visually in Figure 1, one put technique of strategic scenario into the centre of trefoil intersection, which means interrelation of three fields of activity. Along with it, this intellectual integration technique allows working out offers on interaction of different «lobes». By the present time unconventional experience of usage of the mentioned synthesis methodology is accumulated. Particularly, three months before the acute phase of the world financial crisis of autumn 2008, in its summary Modena declaration, session of strategic scenarios «World Finances: New Initiatives», carried out in the beginning of July 2008 by joint Russian and Italian group of representatives of all «lobes» in Modena, identified reasons and, what is more important, offers on surmounting the crisis, which are still urgent in 2011. In spring 2009, within the frames of Session of strategic scenarios «Instrument Engineering as a Springboard for Formation of Innovative Industry in Russia» carried out in Ioffe Physical Technical Institute, with the RF President’s Administration participated, practical opportunity was worked out to create meta-industry in Russia, which specifies administrative technique of making new sectors of industry on the basis of Russian breakthrough fundamental developments. In order to prepare this report one worked out interrelation «science – industry» from the position of attraction of long-term investments at the session of strategic scenarios «Social and Economic Effects of Modernization: from „smart“ devices to „smart“ social networking services as a subject of „smart“ investments» (Moscow, 28 February – 2 March, 2011). This kind of movement cannot be called «manual control», as in the result of working out of scenario, its division into separate projects and planning of their implementation, one can find common institutional solutions, and not only for this sphere. Later this principle can be considered as formation of new organizational base «from below», from the situation. Organization of modernization processes around technologies as the most important tool of formation of social capital, and platform of modern manufacture allows defining clear criterion – if modernization takes place in each concrete case or not. If technologies are mastered, on their basis one produces new products or services, if on the basis of unique device a technology is created, which is sold at international technological markets, this means that modernization process takes place. And in this case process of stagnation, social degradation, uneffective (or corruption) financial expenditures will be opposed to the process of social mobilization oriented at realized socially important result. It means that outlook of increase of social conflicts under conditions of reducing social capital is opposed to new step of creation of social capital, which, under modern conditions, presupposes integration of science, industry and education. Today developed world is actively trying to discover, how will post-crisis technical and industrial, social and cultural structure look like, what will be the next general-purpose technology, which will be the subject of main financial investments. In Russian fundamental science a whole range of projects of post-crisis future technologies is being developed. These solutions, as a rule, exist in form of unique devices created on the basis of new physical principles and effects. In fact, in this connection the following topic for analysis occurs: shall we only borrow Western technologies? Or should we form cooperative chains over the boundaries of creation of cells of new technical and industrial structure and general-purpose technologies of the post-crisis economy? If the former requires our investments only, the latter will be paid by the West also. However, second solution turns out to be related to capitalization of domestic fundamental science, its inclusion into chains of works on creation of the next generation technologies and to the entrance to the world technological markets. It is essentially important to fix the following: revolutionary technological solutions are not built on the breaking of existing technological infrastructure. They are means of a special type, which are built over it and transform flow of technological process in order to reduce expenses and increase power and quality sharply. This is the general principle of operation of regulating device, which is built over the functioning technology. When we talk of technologies of the following structure, the matter is not just about possible new sectors, not about formation of intellectual industry on transformation of existing industry. Industry, which is built over the existing industry and transforms it, is called meta-industry. Within the frames of this approach one can consider and estimate fundamental not complete forming of Russian industrial systems, lack of entire blocks, which should be borrowed and created. If one pursues a course of creation by Russian developers in cooperation with Western technological centres of next generation technologies, a question arises – how should one accompany (in organizational and financial connection) prospective developments at the most complicated section of the way, which is called «death valley» of innovations – at the section from scientific discovery and its implementation in a new device to the technology as a subject of market turnover. What can be the subject of long-term investments ensuring creation of a technology on the basis of scientific discovery, if this technology could be the basis of formation of new sector or cluster or new social infrastructure? What does determine value of money, by means of which we suppose to finance innovative projects? What distinguishes countability, which unit is dollar for now, from calculation used at making up business plans? Institutional traps in organization of financing of «death valley» and exits from them offered by Long-Term Investors Club founded by leading European banks are a very important subject of analysis as well. Conclusion Section contains main conclusions, which can be interpreted as instructions to act for political structures and persons making decisions in the sphere of technological modernization policy. Till the present moment, when one considered technological policy, one did not distinguish technology seen as a thing (set of machines, mechanisms, devices and their operation instructions system) from the technology as a system of reproduction of industrial activity limited by definite parameters and standards. In the first case there is a sense that technology can be bought like a thing and transferred to the territory of a country, which bought it. Then technology is no more a subject of mastering, but it becomes a subject of use. From this point of view, purchase of screwdriver assemblies is not a subject of technological policy, but can be subject of industrial policy and trade policy in relation to, for example, delivery of Russian market to Western automobile companies with the aim of «joint» projects. To make a purchased technology a subject of technological policy, not only finished goods services should be transferred to the territory of a country, but also different development and technological centres and application laboratories, which should be staffed with our specially trained employees. Representatives of fundamental science should have access into these international centres. Inability to take part in creation of own processing lines, designing own automobile, its engine, electronics, assemblies excludes the country from the manufacture of main part of the product value added. The fact that processing lines are located on the territory of Russia does not mean that Russia is more developed from the technological point of view now. Its inhabitants serve imported technologies, but cannot improve and create them. Besides, Russia still has fundamental science, which leaves Western one behind in a considerable number of directions. In theoretical backlogs Russian scientists have a series of fundamental discoveries of new physical principles and effects converted into unique devices, which did not turn into technologies yet. On the basis of these devices one can create technologies of the next technical and industrial, social and cultural structure to replace the existing one. It would seem, Russia has a chance «to leave technologically behind without coming up», if one would turn these devices into technologies and start implementing these technologies in business of large corporations. But this strategic step runs across lots of difficulties. Russian solutions, which are beyond the visible horizon of technological development, cannot be implemented into systems of Russian business, which are backward from the technological and economical points of view. They are like «guests from the future» for them even more, than advanced Western technologies. For them to get accustomed one should reorganize the whole business, the whole technological system. And who will pay for this modernization? New technologies are important not of themselves, but as means of manufacturing of new class products and services, which could not be produced without them. In this connection a fundamental question arises: which technologies and how does one should borrow them in order to carry out modernization? It is absolutely evident, that one should borrow that type and that organization of technologies, which can become a basis for independent actions of Russian manufacturers of products and services, as well as producers of new technologies. At that, quality and cost price of produced goods and services should be comparable to the goods and services of Western manufacturers. 1. Technologies of the base are the basis for formation of the whole set of industrial systems of the next level. 2. Technological base presupposes possibility of its sovereign reproduction, i.e. technological base is restored in form of design-engineering idea concerning its reproduction. That is how it differs from screwdriver assemblies, which do not become a base, but are simply operated till they are completely worn out on the basis of elementary labour of their service. If technologies do not turn into subject of transformation and development from the engineering viewpoint, as well as designing groups and science, i.e. super structural systems, they are not basic ones. 3. These technologies are through, because they pierce through many different sectoral systems. 4. These technologies determine formation of subject matter with the aim of gaining new knowledge about physical principles and effects beyond the things mastered from the technological viewpoint. Basic technologies set the world cultural level reached by the mankind from the labour productivity viewpoint, as well as achieved power and expenses. Technologies of superstructure are the means of base transformation and they belong to unique new opportunities of scientific and engineering national groups. Technology borrowing act with the aim of modernization of national technological base is a rather crucial step. It determines success or non-success of all further steps of modernization and technological development. That is why thesis of Polterovich V. M. telling that one should use advantages of backwardness and borrow those technologies, which are not the most advanced and breakthrough, not cut edge technologies, but those, which are in the zone of nearest development, is only half correct. The problem is as follows: are these technologies absolutely «closed» for renewal of activity, on the basis of which they are produced, i.e. for the activity of developers, designers, inventors, planners and managers? Or this activity can be restored and become the basis for the further development on the basis of equipment of this activity with new means. Determination of the contour of new technological basis or platform is very closely connected with the concept of general-purpose technology. Polterovich V. M. describes this type of technologies in his book «Strategy of Russian Economy Modernization» as follows: "Concept «general-purpose technology» (GPT) is for the first time introduced in an article published in 1995 (Bresnahan, Nrajtenberg, 1995). Its name itself contains supposition that namely these technologies are the main motor of economic growth. GPT theory was further developed in a collected works 1998 (Helpman, ed. 1998). Its authors define GPT as a technology, which allows numerous improvements, has different options of usage, applicable in many sectors of agriculture and can be combined with other technologies increasing their efficiency considerably. The latter very important feature is called technological complementarity. Thanks to the listed features each GPT gives rise to the whole tree of new technologies, at that fundamentally changing technological structure of national economy, preventing decrease of output of factors of production and thereby supporting economic growth. Examples of such innovations are: manufacture of bronze, printing, steam engine, electrical motor, computer and Internet. GPT includes also new methods of industrial engineering, such as systems of manufacturing or mass production. Scope of possibilities of each GPT is still limited, efficiency of secondary innovations generated by it is gradually reduced. In order to avoid slowdown of economic growth, one should in time create new GPT, which will replace new ones or will complete them, or will coexist with them. However, new GPT appear rather rarely. If its development is delayed, stagnation can take place. We emphasize that economies of developing countries are not directly dependent from development of new GPT, as these countries can ensure growth due to borrowing of GPTs, which have already proven their efficiency in the West. As appearance of GPT is a rare and irregular event, one cannot predict it. Partly it is determined by the fact that appearance of such technologies is by no means always conditioned by explicit needs of national economy. Some of them, for example, electricity, turn out to be results of scientific discoveries, which are not directly related to practical needs. Moreover, it is difficult to detect them at early stages of development, as originally many GPT are developed for rather narrow purposes and only later they gain their status. Thus, first computer was developed on order of the US Military Department with the aim of decoding and performance of complex ballistic analyses«1. From this extract for us the following is of principle: Polterovich V. P. tells about difficulties, even about impossibility (in some specified sense) to predict new GPT. And from this point of view, GPT is a matter, which is determined after that, when actually a definite kind of technologies won status of GPT. That means that GPT is of explanatory nature, not design. At the same time, formation of national technological base can have scenarios. Its basis should be made up from technologies, which could become a panacea of re-reproduction on its basis of functions, which were performed by other technologies before. Namely due to this re-reproduction general-purpose technology appears. Current moment of financial crisis is just related to the fact that it is rather difficult to define GPT next after computers. Does this mean that one should borrow Western technologies without taking special care about the fact, what will form national technological base? From our point of view, no, one can try to offer scenarios of formation of national technological base on the basis of group of technologies, which could become its basis. But to determine technological basis of new technical and industrial, social and cultural structure, one should go beyond the technological frontier, mastered world technological border. 1»Strategy of Russian Economy Modernization", M. 2010, page 37-39.
completely determine structure of scientific revolution. And namely recognition of this circumstance after that, when bubble of «dotcoms» burst, led to slowdown of investment into innovations and to peculiar «innovative pause». One can look for and offer solutions at this, already «gone», innovative hump of first wave. It is no coincidence that two most innovative companies of the RF are Yandex and Kaspersky. Investments performed institutionally and automatically during the first innovative wave are over, though improvement of information and telecommunication technologies is still going on. V. M. Polterovich thinks that the world financial crisis is caused exactly by innovative pause. The West (the East, correspondingly) does not know, what will be the basis of the hump of the following innovative wave, which mass usage technique is the basis of this hump. But after missing first innovative wave Russian science was very seriously occupied with determination of the basis of the second innovative wave. Today we can say more confidently, that the basis of the «hump» of the second wave, which is now only approaching, will be laser-meta-industry (fibre optic lasers, high-intensity pulse-periodic lasers). Lasers have great amount of usages – from new space engines to replacement of existing machines. And finally, third innovative wave is possible as a superposition of the first and second waves. In this case one can mark out spheres, where purposeful, specially organized advancement is carried out with the aim of making new mass usage technologies, but at that one uses information and telecommunication solutions to build these new technologies. It becomes clear, that the following stage of development of world economy will not be «post-industrial». 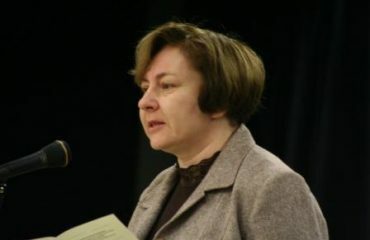 And strict followers of post-industrial society, for example, prominent Russian economist Vladislav Inozemtsev, recognized the necessity of coming wave of new industrialization. It is also related to the fact that new industrialization means new working places and, therefore, active social policy aimed at growth of standard of life of people, first of all, youth. If this policy does not exist, instability occurs as a result, with youth riots-revolutions of Arabic model. Social perspective is an important factor as well – one cannot buy the youth off. Disappearance of progressivism in form of nonstandard tasks of development, related to them strategic types of employment and notional social perspective results in instability. Interacting with Western technological, and sometimes financial, centres, transfer of technologies presupposes possibility to improve these technologies on the basis of own engineering solutions. If such solution was developed and implemented interactively with representatives of fundamental science, engineering groups, institutional centres, which ensure training of manpower able to develop this type of technology, one can say that transfer of technology is performed and it is included into Russian institutional context. The technology has become our own. But to do this, Russian scientific and engineering groups should be able to work at technological markets, able to create technologies or their fragments turnkey and sell them. It should be noted that for the last 30 years concept of industry has changed dramatically, which resulted into discussion about what should be done in the first place to develop national economy: industrialization or post-industrial development of knowledge-driven economy? In the West there are almost no places left where industry is called flow line production of Fordist-Taylor type with considerable elements of badly technologized, mechanized manual labour. High-technology and robot-tended systems are related to industry. However, from our point of view, these are rather user services of finished technologies, and new type of industry should be considered as an activity on development of technologies and devices, which ensure transformation of existing assets. We call this type of industry meta-industry – industry aimed at transformation and re-technification of existing industrial spheres and assets. Such transformation uses such means as new devices, which allow gaining fundamentally new knowledge about existing technological systems, as well as advanced manufacturing systems, such as rapid prototyping systems, centres of digital equipment revamping, centres of standardized measurement and many others. The matter is not just about the manufacturing of means of production, but about development of special intellectual systems. They can visually model and design device of a required industrial system, for example, by means of open virtual design environments. Besides, one should, first of all, use such technologies, which become means of transformation of existing technological systems. During the period of Soviet rule three full-scale complexes were formed in the country - fundamental practice-oriented science, developing education and industry. These three complexes distinguish Russia fundamentally from a series of other countries, for example, Brazil and its approaches to modernization (see, for example, Clyde Pestrowitz). Brazil experience of industrialization is very interesting, but Brazil does not have fundamental science. Brazil has just been developing fundamental science. Japan also does not have institutionally full-scale fundamental science. Moreover, we affirm that in the world of today only that country has a real sovereignty, which has all three developed above-mentioned complexes, and which is able to define goals of technological breakthrough, and «overstep» so-called general usage technologies. Mechanism of meta-industrial approach, formation of original industry (intellectual industry) for the development of industry, implies usage of fundamentally new devices as a source of development of next generation technologies. This approach, which is going to replace old machine-tool construction, is already implemented by Valentin Gapontsev Corporation and related to development of new tool-associated laser systems. Formation of national technological base presupposes that we could assign definite set of technologies integrated with each other, on the basis of which one can carry out transformation of almost all other set of technologies. From our point of view, different devices and information and telecommunication systems form the basis of so-called meta-industrial approach. To be more substantial, solid-state, gas and fibre optic lasers should become mass usage technology, and among solid-state and gas lasers - high-frequency high-power pulse-periodic lasers. Exactly on the basis of lasers one can develop fundamentally new technological platform for modernization, as lasers are related to production of new machines, formation of new materials, new types of influence on living organisms, formation of new processes of power generation and its long-distance transfer, development of new engines. When developing new technological platforms as a basis of designing of post-crisis economy, it is very important not to get into a trap of fixation of new innovative and technological solutions using old organizational and sectoral and departmental forms of segmentation of industry, economic sphere as a whole. Financial principle of consolidation of state and private economic units around the platform is praiseworthy, but it does not solve problem related to drawing boundary lines and contour of the platform itself. One can mark out two institutional traps of this kind: first one – all market smallness of science commercialization is borrowed from the West (industrial parks, business angels, venture funds, etc. ), but it does not concern methods of state strategy development and technological development management (American FCC is just the most developed example, France, Japan, Israel use similar methods). And second one: instead of system of contractual management with goal-setting, financial institute of something like banking type is created, which is actually can at the best be financial broker with financial instruments acting shortly. Second case will be considered in details in the next chapter. Technological platform should obligatorily be meta-industrial: its structure shall include new instrumental principle, which ensures transformation of old technological systems. Thus, for example, fibre optic laser systems are the instrumental principle in relation to machines, machine-tool construction and propulsion engineering. Thus, technological platform is traced out as a zone of diffusion, re-organization and mastering by new technological solution of some initial old sector. Technological platform shall contain idea of synthetic co-organization of several infrastructures. In this case scale of innovative reforms is increased. Thus, for example, due to new type of polymer materials use of gravel is sharply reduced at building of railroad bed, which increases its stability in case of construction of lines for superhigh-speed trains; polymers can be used for construction of new generation highways and highway stream crossings as well. Finally, technological platform shall be integrative, ensure realization of solutions, which unite several new physical principles and effects into a single technological assembly. In this case science linkage of technological platform is increased. However, other matters are also important. Using approach of this kind, one applies technological platform as a zone of diffusion (spreading) of new solutions. Technological platform should also be cooperative and integrative, ensure inclusion of Russian science and engineering into Western corporative industrial and marketing and financial chains. In this case technological platform acts as a peculiar communicative ground. Inclusion into cooperative chains should ensure access to Western technological markets. Finally, technological platforms should be organized in terms of location and clusters and ensure process of re-settlement and territorial re-development of Russia, making profitable working places in form of strategic types of employment and perspective settlements. However, it is important as well not to get into trap of miscoordination of old existing technological platforms and new borrowed ones. From the position of our methodological group, main feature of a new formed technical and industrial platform consists in formation of meta-industry – industry aimed at reorganization of existing systems of industry. Common basis of means of meta-industry is devices, which should be considered as all-purpose tools, but not as technological process control systems. Devices, so understood in the wide sense, can contain industrial and production processes in themselves or generate these processes around themselves. From this point of view, Soviet satellite was not an aircraft, but device. Laser is a typical device. But to make process of transformation of existing technical and industrial platform happening and to start formation of new platform, several technological groups of representatives of practice oriented fundamental science should perform tunneling through the existing technical and industrial platform. This process of tunneling can be performed in different ways. Usually, in Soviet period it was described as coordination of activity of different institutes – fundamental science, applied science, and planning and design office. Often results of such tunneling were deplorable. Process of implementation of new technique took years. Today development of new samples of technical solutions and implementation into industrial production can be performed in a fundamentally different way. Due to destruction of institutes of science and designing institutes, to coordinate their activity is to lose time and money. That is why Head of IPG Photonics Corporation Valentin Gapontsev and his employees realized organization form of movement made by complex group from conceptual idea to development of technological industrial unit, ready for use in different industrial companies, with the retention of ownership of the technology itself and its transfer at each stage. As a matter of fact, this type of development and realization of technology is the concrete form of tunneling through the existing technological platform to the points of formation of new platform. What does determine type of success of activity of such a scientific group? It consists in the fact that the group manages to combine in its sphere of activity a bunch of different technological solutions, when promotion and improvement of one of the elements of this bunch then leads to development and promotion of other elements. IPG Photonics Corporation headed by Valentin Gapontsev develops fibre optic lasers and communication systems. «Thus, fibre lasers actually combine features of emitters (laser diodes), emission amplifiers and high-performance light guides. Classic solution of the problem – three in one! Fibre lasers go through the period of a very rapid growth. First kilowatt fibre laser appeared in 2002, and in 2005 laser of 36 kW is put on the market. On an average, every year power of fibre lasers is doubled. Almost immediately after development fibre lasers started to be used in industry. Future belongs to machines on the basis of high-power fibre lasers, as Russian leading laser specialists think, who began to produce machines on the basis of high-power fibre lasers. Thus, developers of IPG concern affirm that they left their competitors 5 years behind» http://expert.ru/expert/2008/27/skorost russkogo fotona/ . The group moves and at the same time it improves light-emitting diodes, optical fibres, optoelectronic modules, emission amplifiers. Progress related to each of components allows improvement of construction of fibre optic laser as a whole. But formation of new technical and industrial platform cannot be reduced only to change of system of machine-tool construction on the basis of fibre optic lasers. New technical and industrial platform is formed on the basis of multi-tunneling of several groups simultaneously, which are similar to the corporation of Valentin Gapontsev. Other laser trend, which has great potential of overcoming of existing technological systems, is V. V. Apollonov trend. Foundation of RosLaser Corporation can be considered as one of variants of formation of technological platform. It can be founded on the basis of developments of GPI RAS High Power Lasers Department. All fundamentally new technological developments of the Department can be combined into four groups united by a single basic development in the sphere of laser technology. First group is presented by developments on the basis of high-frequency high-power pulse-periodic lasers (average power – 10 – 100 kW, pulse duration – 50-60 ns), both solid-state and gas ones. Its main task is to realize principle of regenerative amplification of laser emission, which is reflected in change of construction of pump system, optics and resonator of high-power CW laser. This modernization allows, using regenerative amplification of laser beam regulating its duration, switching high-power lasers from continuous into pulse-periodic mode without losing average power. Interest in high-frequency pulse-periodic operating mode of high-power lasers is caused by the fact that their emission, when interacting with a substance, results not in heating of processed surface with further transition of substance into liquid and then gas phase, but to ablation, or extraction of particles of substance from the solid phase directly to gas phase. At that, duration and pulse-repetition frequency ensures plasma recombination required for quality processing of surface. This plasma is formed in the point of contact of emission with substance, and at the same time high pulse-repetition frequency ensures possibility to process material as if by means of a beam and not of separate time-isolated pulses. Quasicontinuous processing is implemented. Second group of developments is combined on the basis of technology of phased matrix of laser diodes. Its essence is in implementation of principle of phase adjustment of emission of many low-power semiconductor lasers, which allows considerable increasing, and in fact, summing power of separate diodes in one laser beam. Third group of developments includes several generations, which replace each other in relation to possibilities of ultraviolet lasers, at that, last generation presupposes implementation of high-power UV-laser at one crystal as an active medium. This allows implementation of the possibility itself of development of high-power laser with UV-emission. Forth group of developments consists of optical elements and systems on the basis of silicon carbide required for construction of telescopes (including space-based ones) and modern optics of large dimensions. 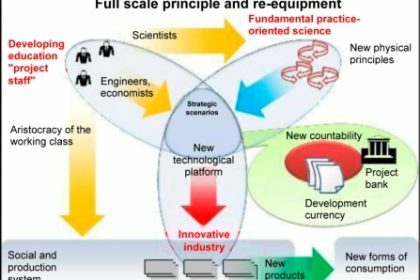 Described effects of making new cost (due to products of fundamentally new quality, fundamentally new products, fundamentally new markets) are ensured by implementation of potential of scientific developments. That is why matter of laser meta-industry is the matter of demonstration of effects of development in other sectors due to their modernization on the basis of laser technologies and laser equipment – products of laser industry. Concept of meta-industry presupposes that a sector is formed, which products allow modernization of assets of some other sectors in such a way, that there appear fundamentally new manufacturing capabilities within the frames of the same basic tasks, which are performed there, but with considerable addition to the quality of their products or addition to capitalization of these assets. At that, within the frames of the sector, which acts as a supplier of basic manufacturing technology or technologies for this series of sectors, own cycle of re-equipment is started on the basis of its sectoral technologies built on the basis of new scientific principles, and each such cycle of re-equipment and augmentation of capabilities of this developing sector leads to launch of cycle of modernization and augmentation of capabilities of all related sectors. Moreover, on the basis of new developments and, correspondingly, new products of basic sector, new types of industry can be created, which never existed before. It may happen due to solution of industrial, technical and infrastructure problems, which never solved before on principle. One can distinguish a series of key lines of activity of laser meta-industry. To describe them, one should mention discussion of those effects, which are caused in other sectors by laser technologies. a. In mechanical engineering one gets an ability to cut and process ultra-hard materials (metal, ceramics, particular kinds of plastic) and glass. b. In mechanical engineering new high quality of cutting of materials already being processed appears due to move to cutting in the process if ablation not heating. c. In microelectronics an ability appears of considerable miniaturization of LSI due to operations performed with the accuracy and resolution of laser beam used as a main tool of configuration of LSI elements. d. In oil production, oil processing and transportation of oil and oil products an ability appears to clean surface of water bodies off poured oil and pollution with oil products. e. In the same spheres new method of cutting of burning holes flame and their extinguishing appears. f. In cosmonautics now one can launch satellite and any other cargoes «on laser beam». At that energy source and fuel are located on Earth and are not included into the takeoff weight of the apparatus, which allows considerable reduction of cost of taking cargoes into orbit. This opportunity appears due to use of super-power pulse-periodic lasers for the organization of air rupture under the bottom of the apparatus, which generates shock air wave ensuring traction in the apparatus, and high laser pulse-repetition frequency allows making this traction constant. Due to use of polymer, which is easily evaporated by laser beam, as a consumable of the apparatus bottom, described method of movement in ionosphere and vacuum can be realized. g. In power engineering: ability to transfer large volumes of electric energy through the atmosphere via plasmic conducting channel formed as a trace from laser beam composed of short power pulses. In particular, this plasmic channel allows transfer energy from the orbit to the Earth surface accumulated at space power plants currently being designed (for example, large farms with photovoltaic elements, which accumulate solar energy). Besides, an opportunity appears to «catch» lightning – take off static electricity accumulated by cloudy mass via conducting plasmic channel acting as a kind of grounding electrode by way of «closure» of clouds with the surface. a. In medicine: develop compact and economic laser systems of treatment and surgery for such spheres as photodynamic cancer cure, ophthalmology, surgery, different kinds of diagnostics. b. In spectroscopy: develop compact systems of spectroscopes and microscope with high and ultra-high resolution. c. In general to increase output power of existing semiconductor lasers in all spheres of their use. d. Develop powerful and compact laser systems integrated with energy sources. a. In medicine: possibility to efficiently cure tuberculosis due to phototherapy. b. In microscopical, spectral and diffraction analyses: ability to produce compact devices of diagnostics of condition and structure of materials of high accuracy. b. Use of systems of phased laser diodes for multiplication of power of semiconductor lasers. Line of activity, which allows provoking effects described earlier first of all in the sphere of mechanical engineering, medicine and microelectronics. II. Replacement of existing technologies of UV-lasers with the high-power UV-lasers of superseding generations, including those on crystal, first of all in the interests of large-scale medical use. III. Development of laser systems of launch of spacecrafts and systems of laser wireless electric-power transmission. Discussion of the problem of rendering support to a discovery on its way to a technology should be started with the lack technological markets in Russia. Also, it is no secret that today in Russia there are almost no important institutions such as an institution of invention, which could certify the professional status of an inventor as a person of scientific and technical art (more exactly, it has been lost, since such institution existed in the USSR; one of the consequences of its existence is TRIZ, which has a wide distribution in the world at present), institutions of scientific, engineering-industrial and financial-technological audit (expertise), institution of patenting (which is too weak in Russia in comparison with the foreign system of patenting and licensing), and an institution of technological standards. Therefore, the potential of Russian fundamental science today requires one of another form of cooperation with western technological centers. Below, we describe some variants of such cooperation. One of the most important questions is the formation of a pool of technological decisions required for long-term modernization of the Russian industry and engineering and social infrastructures, with participation of big western and Russian capital in this process of modernization. This modernization is based on the formation, jointly with western technological centers, of a package of technologies coming beyond the borders of the comprehended, for selling the same to western corporations in technological markets. After introduction of these technologies in western corporations' activities, these technologies will become the basis for modernization of the Russian industry in the course of interactions between Russian ministries and Russian and western corporations. A western corporation which has proceeded with implementation of a new technology developed with leading participation of Russian experts, puts a peculiar «Quality Assured» on the technology stamp, certifying high western quality. Having received such quality symbol, the technology is transferred to Russia (scheme 1). The principal possibility of purchase of a developed technology by a Russian corporation should be agreed upon, though there have been no such precedents in practice yet. This scheme is based on a built-in full chain of transfer from a discovery to the development, on its basis, of a tentative device embodying a new physical principle or an effect, to a new technology to be sold to western corporations in technological markets. It is supposed that this chain of transfer from a scientific start to a technology should be implemented in interaction with western scientific - and innovative centers. Since there is no technological market in Russia, a cooperation chain would be formed. This chain would ensure transfer from a discovery to the invention of a new device, and then to a new technology, based on partner cooperation with independent foreign technological centers (middle and small private high-tech enterprises), and by no means with R&D centers of big corporations who, as a rule, are simply interested in purchasing Russian scientists and manning their own centers, or in purchasing discoveries in order to shelve them if they are «closing» for their market. A condition for formation of such cooperation chain is not the full isolated independence of Russian scientists, but a peculiar original division of labor with the purpose of presentation of Russian discoveries in western technological markets. To enter western technological markets it is required to use western institutions of scientific, engineering-industrial and financial-technological audit, patenting, licensing, and technological standards. Apart from interaction of Russian developers with middle and small private high-tech enterprises who may convert a device into a commercial technology, it is reasonable to interaction with technological brokers. At the productions existing in the world at present, a primary layer of aluminum nitride, which is the base for production of light-emitting diodes (LED), is formed on plates made of artificial sapphire. The shortcomings of a sapphire substrate is its high price (as compared with silicon), and the lack of electric conductivity. The last feature complicates the LED production technology and, consequently, increases their cost. In the military and outer space spheres, plates of monocrystal silicon carbide, which possess necessary electrophysical features, may also be used for improvement of reliability and stability to external exposures. These plates are more expensive than sapphire ones in dozens of times and, besides, the American firm "CREE Inc. is almost the only manufacturer of such plates of proper quality in the world. In 1998—2009, NII IP MASH RAN in the city of Saint Petersburg, with private financing and under leadership of Professor S.A. Kukushkin, has developed a method and has formed an experimental production for growing a silicon carbide layer with the thickness of from one tenth to several dozens of microns on standard crystal silicon plates. Such substrate may become the basis for a multi-layered structure of LED, since a high-quality layer of aluminum nitride is applied thereon using well-known methods. The price of a crystal silicon plate with a thin layer (nano-layer) of silicon carbide, suitable for creation of a semi-conductor structure of LED is up to ten times less than the price for a plate made of sapphire and up to several hundreds of times less than that of plates made of monocrystal silicon carbide. And the properties of a multi-layered silicon-based semi-conductor structure do not yield to structures based on crystal silicon carbide plates by their electrophysical characteristics, reliability and ability to work in special conditions. There is no industrial production of silicon carbide plates and plates with nano-layers of silicon carbide in Russia. Only an insignificant quantity of pilot productions are operating. The consumption of this product in Russia has been quite insignificant recently, but at present domestic enterprises need for cheap raw materials for production of electronic devices. Therefore, the potential of the domestic market for implementation of such products is great. The competitive advantages of the product are mainly explained by the advantages of the new method of growing silicon carbide films on silicon. 1. Optoelectronic devices - LEDs, semi-conductor lasers, light-sensitive cells (solar batteries). 2. Microwave frequency equipment - mobile phones; satellite TV; radars. 3. Field-effect transistor and thyristors - household and digital equipment, microprocessors, refrigerators; washing machines; microwave ovens; video equipment. 4. High-voltage devices and power supplies - bipolar transistors and powerful thyristors for power cables of electric trains and electric drives. The consumption of monocrystal silicon carbide plates in natural units was about 500,000 units in 2006, and has increased approximately to 600,000 units by 2007. By 2010, the consumption may exceed 1,000,000 units. The average annual growth of consumption of silicon carbide plates in the world is about 20%. The consumption of gallium nitride and aluminum nitride films may by 2010 exceed 2,000,000 units each. 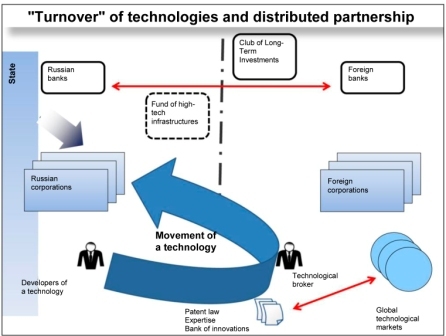 It is well understandable that the formation of a local cooperation chain «across the borders» from a Russian fundamental scientific decision to a new technology may last for a long time, unless it is picked up at a certain level by holders of capitals - Russian and foreign banks or by non-banking financial investors, both private and united in investment pools. In this case, banks, based on agreements, would act in their own territory each, coordinating and insuring the formation and sale of a new technology as a whole on the grounds of international interactions. Another focus of action consists in the substantiation of orders for certain new technologies developed by Russian scientific and technological groups, on the part of certain FCP developed by Russian ministries and corporations. Certainly, specially developed investment schemes may be the subject of negotiations with the bank community, separate holders of large financial assets (private and institutional - partnerships, pension funds, insurance companies). The scheme below provides a special class of investment schemes (see scheme 3), implementation of which requires «long-term money» in the form of long-term investments. This type of schemes is in principal aimed at overcoming the notorious «death valley» on the way from a discovery to a pilot model. As is well known, financial tools available in the West are business-angels: venture funds begin to work only after a technological decision has been used in a firm's activities and has brought first profits. Till this moment, no financial tools are used. These financial tools ensure business expansion. The specific feature of the new class of investment schemes consists in concentration on the two points: a fundamental discovery which guarantees monopoly development of a new technology based thereon, - and a project of a new branch - cluster or a new social infrastructure, based on a new generation technology. The existence of two principal points: a fundamental discovery, on the one hand, and a project of new branches and a social infrastructure, on the other hand, constitutes the «two-point» characteristic of the scheme of long-term investments. The subject of investments is not these two points - a discovery and an opportunity to create a new branch, but the detailed description of the stages of creation of new businesses. The existence of these two points is the peculiar evidence that the work with such discovery will result in the structuring of a new capital-intensive sphere. If a discovery exists and it has been realized in the course of development of a new technology in the form of a device, and is it is clear that a new branch is being structured, then the creation of a technological decision is objectively important, and one can proceed with projecting new markets. — technology of production of machine tools with ultrahigh precision and, at the same time, with ultrahigh rigidity, and laser phase-polarizing microscopic equipment. These works are divided into two large spheres AMPHORA Laboratory is engaged in: nano-mechanics, or production of machine tools with ultrahigh precision and, at the same time, with ultrahigh rigidity, and laser phase-polarizing microscopic equipment. 1) Ultra-rigid and ultra-precise aeromagnetic guides directing. All these works are the element base for development of machine tools with ultrahigh precision and ultrahigh rigidity, which allow positioning and working parts, as well as metrological measuring with the accuracy of positioning of up to 10 nm. By the precision and rigidity, the works described surpass all foreign functional analogues, i.e. machine tools intended for precision mechanical engineering and production of parts and structures with ultrahigh precision. The works in the sphere of microscopic equipment are based on the use of phase-polarized laser emission in microscopes. It has allowed to create modulation-interference microscopes (including projection), which allow to observe samples with 3D-nm resolution and with high frequency of an image (frequency of about 10 Hz), that allows «to shoot» a some kind of «nano-movies». Besides, the use of phase-polarized laser emission has allowed to create microscopic equipment (including projection) for observation of anisotropy, also with nanometric resolution. Neither the possibility of nanometric observation of samples in an on-line mode, nor the possibility of observation of anisotropy with such resolution have been realized before, or are provided by any foreign functional analogue of such devices. It is very important that the technologies proposed are attributed to the category of META-INDUSTRIAL technologies which are built on existing industrial assets (operating lasers, boiler-houses working on gas and coal, etc. ), and form more effective and powerful systems. And the old branches and assets are not destroyed for their replacement with new ones at the expense of huge capital investments with construction from the zero cycle, but are supplemented with rather small investments. In this case, modernization of the industry is based on multi-layered schemes - when new tool systems are distinguished, being the base for processing the existing industrial assets, on the one hand, and a corresponding subject of transformation is separated, on the other hand. It is quite obvious that the creation of new branches and clusters, and the capitalization of breakthrough technologies require essentially new financial tools. The traditional type of tools does not work. According to the founders of RosNano SC, at least proceeding from the purposes of creation of this state corporation publicly announced, its activity should result in creation of a lot of high-tech branches in the country, including microelectronics, nano-technology medicine, production of nano-structured materials and coverings, super-precision mechanical engineering, etc. Meanwhile, the activity of SC by the moment has not resulted in the emerging of any one from the listed branches of the industry and practice. A question arises what is the reason of such situation. 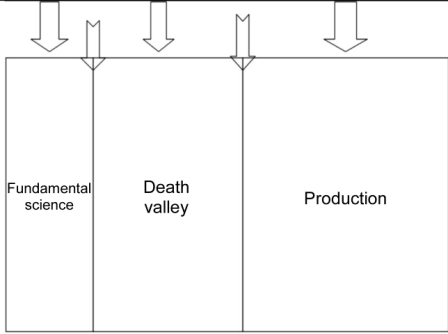 The designed scheme of movement from a unique development to commercial series (scheme 1) includes three blocks: work of fundamental science, which results in production of a technological sample - a device or a way of the process based on new physical principles, which still should be brought to the state of a technology ready for introduction; «death valley» or a period of research and development work whereat a development is brought to the state of a technology ready for replication - the most problematic part of the way; transfer to the functioning of a business-system and commercial production or modernization of an existing asset. Five points of necessary management arise within the framework of this scheme, which require activities of SC: management of requirements to fundamental practice-oriented science, management of coming through the «valley of death», and management of realization of a wide commercial production or modernization of existing productions. Also, two points of joining of different stages of the way, which stages require management of transfers of a development from fundamental science to «network intellectual research institutes», and of transfer from the stage of research and development work and coming through the «death valley» to industrial production or to large-scale transformation of the industry. 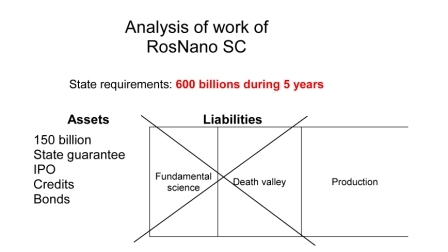 The analysis of the financial structure of activities of RosNano SC (scheme 2) shows that this structure could not realize the described scheme, given the existing conditions of work of SC. 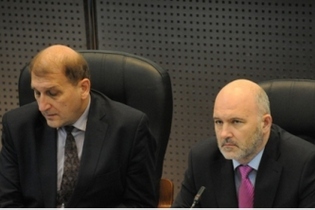 The duties of RosNano SC included the attraction of investments and funds for investment in high-tech projects, using 150 billion rubles received from the state budget, and applying all available borrowed capital: placement of shares (IPO), attraction of funds under state guarantees, credits, and issue of bonds. During five years, SC should have 600 billion rubles as funds attracted. Given this structure of assets and the conditions of activities, the only real purpose of GC turns out to be the security of such liabilities, that is why 100 billion rubles from the amount received from the budget «have been frozen» as security of assets. Besides, during the period provided for attraction of capital, SC was unable to risk, investing in assets which would not guarantee reliable short-term capitalization at a required level. This has resulted that RosNano SC has decided to invest in such companies which have already reached industrial production and whose short terms capitalization has met the conditions fixed for SC. Such decision has manifested itself in that SC has purchased western high-tech companies and assets with well-forecast capitalization. The analysis shows that the administrative and financial mechanisms of activities of RosNano SC do not meet objectively the task of implementation of the potential of pioneer high-tech development in the form of long-term effects of development of the industry and creation (or transformation) of strategic infrastructures. 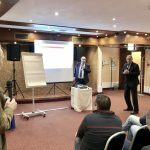 Moreover, the described financial strategy of attraction and turnover of borrowed funds for a short term is typical for the modern banking sphere, as was noticed by the Italian expert in the field of financial architecture Paolo Raimondi. We have faced an institutional trap of modernization. 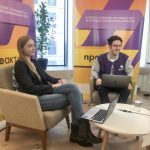 Instead of developing new tools for financing long-term high-tech development aimed at formation of new branches and clusters, a traditional financial institution is used, such as a bank which is interested in preservation of financial liabilities, instead of investing in a promising sphere for a long term. 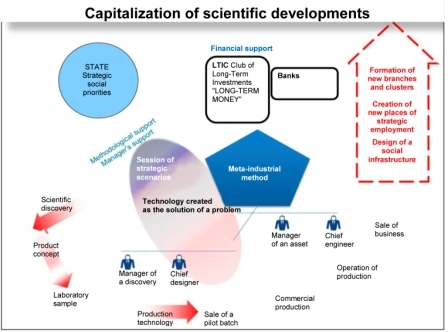 It is this structure of the bank sphere which makes it impossible to finance scientific development and to create a high-tech infrastructure of next generation. For solving such tasks (financing of scientific development, creation of high-tech small and middle enterprises, investment of construction of an infrastructure), the largest western banks such as Caisse des Dépôts (CDC), Cassa Depositi e Prestiti (CDP), European Investment Bank (EIB), KfW Bankengruppe, initiated in 2009 an International club of long-term investors . Franco Bassanini, one of the members of the Club of Long-Term Investors, considers that, taking into account the budgetary restrictions and the needs for consolidation of taxes, it is very important to attract private capital on the basis of creation of new financial tools and legal frameworks more favorable for long-term investments, which ensure innovations and a steady growth. But a real challenge could become the creation of a peculiar financial innovation - social Keynesian economics friendly to innovations, which would use the same large-scaled investment resources, which were used in the past to finance military and space programs (for example SDI), but at present - already to finance huge ambitious programs of innovative development and environmental protection. These programs should at the same time solve Keynesian tasks and be focused on the problems related to development of new technologies. The European Union could easily collect in global markets about € 1-1.5 bil. for such programs. The tool for these programs could be European sovereign bonds. Actually, for solving these tasks, the Club of Long-Term Investors also creates special tools in the form of Investments Funds for investment in development of the infrastructure of the Mediterranean Sea Region (Inframed Fund), creation of high-tech middle and small enterprises (Margaret Fund), financing of scientific researches. From Franco Bassanini's point of view, in the forthcoming years, the struggle against state debts will negatively influence the growth rate and will increase the costs of a socially-oriented state. In addition, the economy should support the growth of the aging population. Therefore the problem is a structural one, and not a simply cyclic. The restoration of a bearable controlled debt in the interim outlook is a serious challenge. Investment in researches and development, and development of the infrastructure require a long-term outlook and a long-term horizon in connection with the horizon of realization of projects. Large-scaled researches and development and fixed capital investments influence the long-term economic growth, since they improve efficiency. At the same time, the capital invested is not repaid at once, but within several years. This type of investments is mainly connected with improvement of business and consumer environments, based on modernization of frame interrelations, reduction in transport costs and support to the «green» economy, alongside with other things. Investors oriented towards long-term investments are characterized by weak support to short-term market liquidity, since they have access to stable resources based on regular and guaranteed deposits, long-term savings and long-term loans. As a rule, they have a healthy basis of capital, which is connected with accumulation of reserves and allows them to level short-term fluctuations in financial markets (through borrowing additional resources in bad years and replenishing them in good years). Long-term investors include basic institutions which finance economic development, such as the European Investment Bank or KfW Bankengruppe, sovereign funds, pension funds, insurance companies, etc. Actually, the technologies emphasized by us, and on the basis of which new branches may be created, in particular a laser cluster which may have the form of a Roslazer metaindustrial corporation, may become the subject of a special study with holders of financial resources (banks, funds, insurance societies, private persons). Holders of financial capital, who develop certain schemes of long-term investments in creation of new technologies, may be organized into a «Fund of high-tech (smart) infrastructures». According to the preliminary negotiations between Paolo Raimondi and Franco Bassanini, relationships between the Club of Long-Term Investors with such Fund are one of the strategic priorities. Since a huge state bank cannot replace regional network structures aimed at provision of financial services. The Fund's primary goal is to offer a new approach to the measurements of long-term investments and an idea of new countability. According to this vision, a new cellular countability-connectivity of infrastructural links is formed based on new technological decisions and specially trained competent people capable of serving such technologies. International development money may be specially created for realization of such type of projects. Such development projects of international meaning and importance should undergo consideration by a special advisory council (probably, by an advisory council for development projects of the Club of Long-Term Investors) to receive such status. Development money may be evaluated in respect to the existing money as 1 to 10, since the task of development infrastructures is to ensure a growth of capacity in 10 times (solid-state pulse-periodic high-frequency lasers ensure such a growth of capacity), at the same time reducing non-recoverable consumption of natural substances. Development money may exist as bonds of development projects, having a fixed international value in the form of the status assigned thereto. In this case, development and realization of projects is broken into such units and terms, where the today's generation does not take funds out of consumption and does not reduce the consumption level to the prejudice to themselves in the interests of the future generation, but starts to earn already now in any certain parts of the period of realization of projects. With such approach, everything turns upside down from the point of view of the theory of generations and their participation in the process of long-term investments. Long-term money do not limit the consumption of today's generations for benefit of future ones, but allows the future generations to have other, more promising and sensible future, and the today's generations - to earn on correct investments in the growth of public well-being, and thereby to ensure worthy old age and active longevity at their free choice, and not compelled employment at the expense of the increased pension age. This guaranteed future is first of all connected with creation of promising systems of employment, highly remunerative workplaces in regions, as well as social infrastructures. Project development bonds may also be connected with creation of social infrastructures of a new type. The technologically sound modernization is aimed at the creation of promising productions in regions, based on strategic types of employment, and at the increased level of development of a social infrastructure (development of the town-planning projects, which ensure perspective apartments, improvement of public health services, leisure). Promising types of employment, highly remunerative workplaces, as well as development of a social infrastructure in regions directly influence people's desire to live in our country, and are connected with the concept of life strategy. It is possible to state that the concept of life strategy is a cautious attempt of an interpreting translation of the term «biopolicy» into Russian. The term «biopolicy» has acquired a completely new meaning in the works of modern philosophers: Michel Foucault, Jelles Deleuze, Giogrio Agamben, and Antonio Negri. The root «bio» in this word is opened through all planetary certain forms of life of all alive systems around man's vital activity in the diversified social conditions from planetary activity of mankind as a whole to the results of a certain administrative policy in a small settlement or community. The word «policy» is understood not as a set of political institutions and authorities, regulating a legal regime of life, but as a notion regulating the social strategy of development of a certain society, which results either in destruction of life, or in overgrowth thereof. If separate groups of population, a certain family, clan, people have a life strategy, people understand what they live for and want to live; they duly construct a long-term oriented activity aimed at reproduction of life in the territory. People start to act according to the semantic horizon of life of 30-50 years. A life strategy is connected with the processes of reproduction of life and social reproduction in the territory. It implies the comprehension of vital interests of man and human communities and the realization of a political and administrative action in a certain region or place, based, first of all, on such interests. The development of strategic development scenarios for various spheres of practice and the formation of new clusters should be tied with the development of certain territories. New workplaces should appear in a certain territory of a region, based on identification of strategic types of employment for the youth; a social infrastructure should be formed. But life in a certain place of a certain region is first of all a new humanitarian social infrastructure, «smart» house, «smart household power», «smart transport», and a high level of social and cultural services. These opportunities were convincingly shown at the international exhibition in Shanghai in 2010. Technical decision: A complex modular System of Diagnostics and reaction, based on a «Cardiomonitor» developed in the RF - a device allowing to carry out complex remote diagnostics of a person's state on the basis of an essentially new technology. The on-line monitor, at a distance from the practitioner, supervises symptoms of main illnesses (death factors): high pressure, high content of cholesterol, level of sugar in blood, and notifies the user on his/her state, gives recommendations, as well as in due time informs special services on the state of health, including a crisis. e) To be the major tool for training the population in skills of control and management of the state of health - system of domestic diagnostics, autogenuous training and other components of valueology and health protection. — The result should become a significant reduction in disease and death rate in the country. 1. Competitive features of a country depend on development of full-scale productive forces therein: fundamental practice-oriented science, developing education and innovative industry. The main subject of action of full-scale productive forces today is the technologies, on which and around of which knowledge and competence unite. 2. The integration of positions of representatives of all three spheres of activity — fundamental practice-oriented science, developing education and innovative industry — around a uniform complex project of a new engineering, industrial, social and cultural way of life is impossible using the administrative methods known today, habitual ways of discussion in the course of scientific conferences and seminars, or so-called «brain storms». The technology of strategic scenarios is applied for this purpose in Russia, which technology has successfully recommended itself in different spheres of practice. 3. For capitalization of science it is required to understand what cycle a certain development should be included in. Whether the result of researches is a reiteration of fundamental researches carried out previously. Or it may serve as the basis for creation of a new technology, structuring of a new branch — cluster and a new social infrastructure, which will embody this technology and will create new products and services? Special importance have researches and development which are leading, and which outstrip development in the West, the authors of which work in close interactions with western research centers — that confirms their objectivity. 4. A transfer of technologies assumes the possibility, jointly with western technological centers, to improve this technology based on own new engineering decisions. 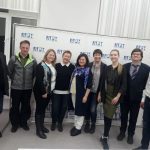 If such decision has been developed and introduced in interaction with representatives of fundamental science, engineering groups, higher education institutions, one could say that technology has been transferred, and it has been included in the Russian institutional context. The technology has become own. But to achieve this Russian scientific and engineering groups should be able to work in technological markets, create technologies on «a turn-key basis», and to sell them. 5. The modernization strategy assumes the integration and system coordination of several different policies: educational, personnel, scientific, taxation, customs, financial, foreign trade, and procurement policy inside the country — in order to create a most-favored treatment mode for those groups which develop and introduce new technologies, create new branches and clusters for overcoming technological backwardness. Initially, it is required to create a strategic development scenario for a certain concrete branch — cluster, for example, laser-building, detonation nano-diamonds, production of silicon carbide on silicon, etc. And within the framework of development of such scenario to coordinate organization of the entire set of policies for ensuring implementation of this certain scenario. 6. Special importance for identification of the subject of long-term investments in science have projects of new branches-clusters, based on substantially new development and new technologies. It is projects in these branches which will determine, where capital will flow in the nearest future. It is possible to state that new bushes of technologies in production of new materials, power engineering, machine-tool building, engine-building, biotechnologies should be tied with new types of the cluster organization of production. Russia claims for creation of a lot of new branches — clusters of this type. But if clusters will start to develop not in Russia, but in third countries, Russian scientists will have all possibilities to sell decisions in technological markets for ensuring the formation of such clusters. 7. The technologically sound modernization is a unique possibility of participation of the country in the global technological renovation and the creation of technologies of universal application, which are connected with a transfer to a new technical and industrial way of living.